One of the magical things about crochet is that once we know the basics, we can use combinations of them to create textures and designs… One of the most used techniques to create these designs is double crochet 3 together. 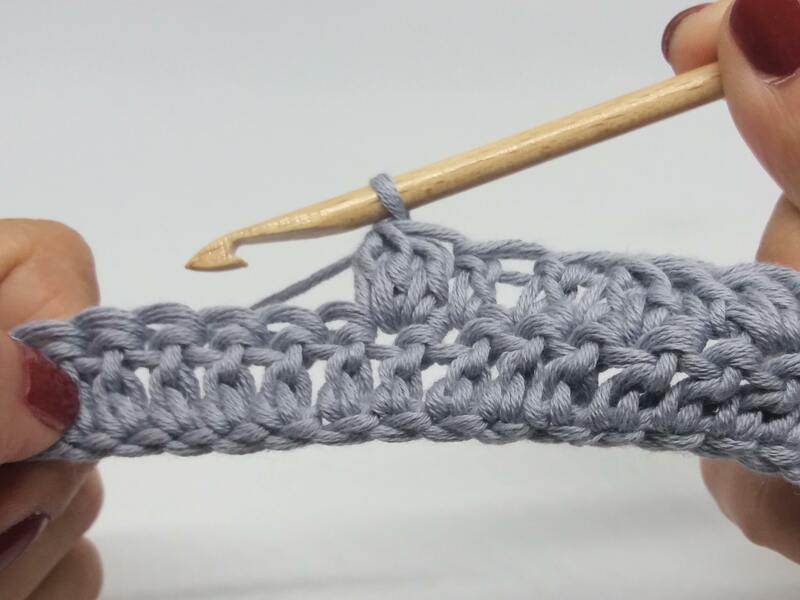 The materials that we use are Pima Cotton in gray and a 5mm crochet hook. The idea is that if you crochet stitches together, they are decreased. However, if you make work than two stitches into the same stitch, you’ll make a triangular shape that can be used to create petals or lace on your garments. We’re going to look at the technique, and then you can use it in your own creations. To crochet three stitches together, wrap the hook with the yarn. Insert the hook into the stitch indicated in the pattern. Wrap the hook again with the yarn and pull it through, you will have three strands on the hook. You will have two strands on your hook. Wrap the hook with the yarn again and insert it into the following stitch, wrap the hook with the yarn and pull it through the stitch. You will have four strands on your hook. Repeat from * to *. You will have three strands on your hook. Wrap the hook with the yarn again and insert it into the following stitch, wrap the hook with the yarn and pull it through the stitch. You will have five strands on your hook. Repeat from * to *. You will have four strands on your hook. Wrap the hook again and pull the yarn through the remaining strands. Now you have double crocheted 3 stitches together. This same technique can be used to crochet 2, 3, or 4 stitches together. The trick is to crochet the stitches halfway, and then crochet them together as if they were only one stitch. This creates a triangle shape that you can use to decrease stitches. You can also use this technique to create a petal effect by working the stitches into the same stitch instead of working them into different stitches. We hope that you have learned this technique to add to your creations. Take lots of pictures and post them on social media with the hashtag #weareknitters.